I am looking for the view of Forfar, Kirriemuir and Brechin residents on plans to add a full time day shift to Forfar Fire Station, in place of a night shift at Balmossie. I am asking Forfar, Kirriemuir and Brechin residents to have their say on plans to change fire station provision in Angus. Tayside Fire and Rescue Board are proposing to switch a whole time night shift at Balmossie Fire Station to a whole time day shift at Forfar Fire Station. Currently there is no whole time provision in Forfar, Kirriemuir or Brechin. Instead, the stations are retained, which means that firemen are on call, but not based full time at the station. 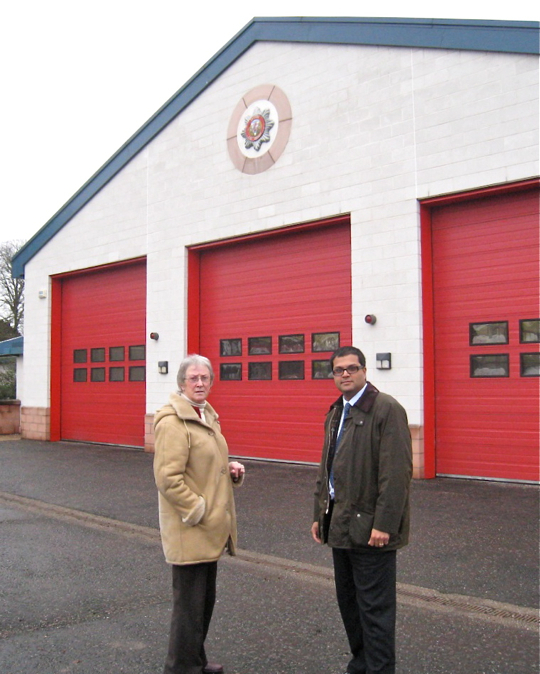 I visited Forfar fire station with local Community Councillor and activist, Avril Simpson. As I understand it, the overnight crew at Balmossie fire station in Broughty Ferry were not called to a single house fire in the last 3 months of 2009, and were only called to two, relatively minor secondary fires between October and December. The Fire Board are arguing that a retained service overnight at Balmossie would be sufficient to meet the needs of local residents, based on 6 years of operational incidents across Tayside. The retained fire crews across Angus and the whole of Tayside provide an excellent service, securing the safety of local residents. The Fire Board noted that the peak time for incidents were during the day. They also stated that research indicates that prevention and early detection is the best way to save lives. They argue that a whole time day shift in Forfar would allow fire crews to carry out Home Fire Safety Visits, which the retained fire men are currently unable to do, due to their full time employment commitments. Cllr Ken Lyall, Chair of the local Fire Board believes that this change will improve emergency response in Forfar, Kirriemuir and Brechin during the day, without impacting overnight cover in Broughty Ferry. The Board also believes that by conducting Home Fire Safety Visits, Tayside Fire and Rescue Service will be able to save more lives. It is crucial that local people have their say on whether they would like these changes to go ahead. I will be distributing a Focus leaflet in Forfar and will ask local residents about their wishes. In the meantime, residents from across Angus can contact me with their views by commenting below. Or if you wish to keep your views private, you can email me at contact@sanjaysamani.com or by mail at Viewpark, Meethill Road, Alyth, PH11 8DE.